All of the SAM systems in the Syrian inventory have a single-target engagement capability. Some of the S-200 sites have been noted with multiple 5N62 SQUARE PAIR engagement radars, allowing those sites to engage multiple targets (one per engagement radar), but the S-75, S-125, and 2K12 sites can only engage one target per site. This leaves the Syrian air defense network susceptible to saturation.... Syrian reliance on aging and well-known Soviet-era SAM systems is a serious defensive liability.... reliance on Soviet-era legacy SAM systems will provide a serious handicap when facing a major air incursion by a modern opponent." 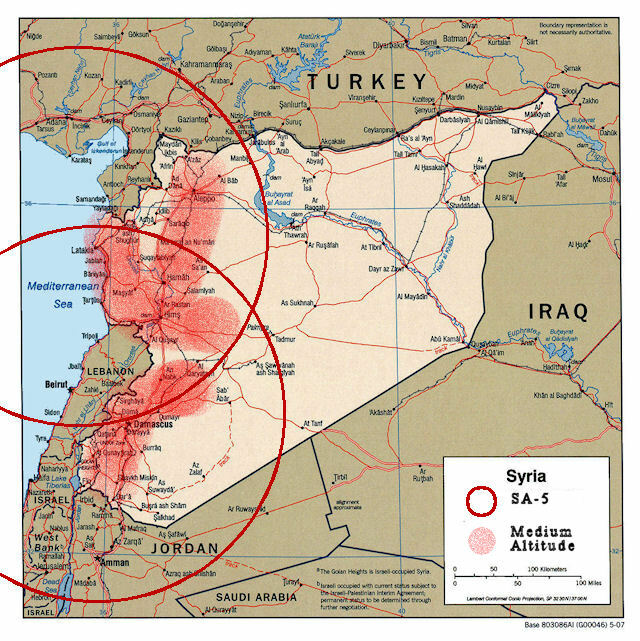 Syria places considerable emphasis on land-based air defenses. The army has more than 2,000 air defence guns and more than 4,100 surface-to-air missiles. In this as in other areas, the army is heavily dependent on Soviet-designed weapons. The Air Defense Command, which operates under the command of the air force, operates longer-range surface-to-air missiles such as the Almaz Volga-M (SA-2), S-125 Neva (SA-3) and Antey S-200 (SA-5). The Air Defense Command (ADC) has a strength of about 60,000 [more than the Air Force strength of 40,000] and controls two anti-aircraft divisions, (AADs), the 24th and the 26th AAD, comprising a total of 25 air defense brigades operating an estimated 130 surface-to-air missile batteries. Most are equipped with SA-2/SA-3 surface-to-air missiles (SAMs); eight batteries are equipped with SA-5 SAMs. In addition, a significant number of SA-6 mobile launchers are deployed, as well as an estimated 4,000 anti-aircraft guns of up to 100mm. Following the 1973 war, Israel developed a coherent suppression of enemy air defenses (SEAD) doctrine which provided the foundation for their astounding performance in the 1982 Bekaa Valley Operation. Here, following a crucial SEAD operation, the IAF won air superiority, destroying 80 to 90 Syrian aircraft during twomonths of fighting with the loss of three to six Israeli aircraft. Air superiority and this lopsided victory were made possible by a well-coordinated SEAD operation destroying SAM and AAA sites in the Bekaa Valley. Before the actual attacks, Israeli reconnaissance aircraft and unmanned aerial vehicles (UAV) detected and located the Syrian air defense sites. Just prior to the air attack, a commando raid destroyed/neutralized a control center, beginning the paralysis of Syrian C3. During the attack the Israelis dominated the electronic spectrum. First, they used Samson decoy drones to trick the Syrians into activating their acquisition and tracking radars. Second, reconnaissance drones reported the frequency and location of the radars. Third, Israel used a wide array of intense electronic warfare operations to confuse and deceive Syrian communications, and to blind Syrian SAM radar units. Finally, long-range artillery, surface-to-surface rockets, surface-to-surface anti-radiation missiles (ARM), and air-launched ARMs pounded the SAM and AAA radar sites. Once blinded, the surviving missile batteries were vulnerable to and subsequently destroyed by cluster munitions. Ten of the 19 Syrian SAM batteries were knocked out within the first 10 minutes, and the Israelis claim to have destroyed 17 batteries and damaged two others during the attack without losing a single aircraft. The Syrians pushed more SAM units into the Bekaa Valley (over night), but to noavail. On day two, the IAF destroyed 11 more missile batteries. Following the drastic aircraft losses it suffered as a result of Israel's air superiority during the latter's invasion of Lebanon in 1982, Syria extensively re-organized its air defense network. The network was re-structured on the basis of a Soviet-supplied command and control system, with three computerized air defense centers coordinating missile batteries and interceptor fighters. Major improvements were made to radar systems, electronic warfare capabilities and the level of integration of the air defense forces generally. Nevertheless, the system is considered to pose only a limited threat to Israeli air superiority, and would be vulnerable to the kind of countermeasures available to advanced, US-designed Israeli aircraft. Particular priority is given to the anti-aircraft defense detection network covering Lebanon and Israel, but Syria has also been expanding its air defense resources in the northeast, to prepare for any attack from Iraq or an attack on its rear by Israel. Syria also take advantage of its military presence in Lebanon to site air defense radar installations there. Syria has one of the most sophisticated Soviet-designed air defense systems outside of the former Eastern Bloc countries. However, it does not include the most advanced air defense and sensor systems developed by the Soviets. The Syrian system appears flawed and some analysts doubt the reliability and efficiency of the computer control network. Israeli sources claimed that by the late 1990s parts of the computerized system sometimes failed to function and then had to be operated manually. The sources claimed that Israel could neutralize Syria's air defense system in 48 hours. Media reported in 2007 that Damascus had agreed to sell some of the Pantsyr short-range air defense missile-gun systems it was buying from Russia to Tehran. Russia did not approve the alleged sale of its Pantsyr-S1 mobile air defense system from Syria to Iran, a first deputy prime minister said 23 May 2007. "We have received no requests from Syria for supplies to Iran, not a single bullet," Sergei Ivanov said at a news conference in Moscow. "Russia engages in military-technical cooperation with all states that strictly abide by international law... For any arms that Russia sells to its foreign partners, contracts are signed only after the receipt of a certificate from the end user. These weapons cannot then be re-exported and supplied to third countries without the permission of the seller, in this case the Russian Federation." The Russian army is currently acquiring the latest version, the Buk-M2 (SA-17), and a large export contract of Buk-M2E to Syria is in the pipeline. The provision of a more capable surface-to-air missile system such as Russia’s medium-range Buk M1 and M2 (NATO SA-11 Gadfly/SA-17 Grizzly) - should it have occurred - would mark a significant increase in the potential SAM threat. The system has a maximum engagement range in excess of 30 kilometers. The overall system, however, consists not only of the tracked missile-launch vehicle, but also target acquisition radar and command post vehicles, and as such also brings with it a substantial training requirement. The Russian Defense Ministry said that Soviet-made S-125, S-200, Buk, Kvadrat and Osa systems, used by the Syrian military, intercepted 71 out of the 103 missiles fired by the U.S. and its allies on 14 April 2018. Following an overnight April 14 missile attack, launched by the U.S. alongside France and the U.K., the Syrian president said the strikes came as the West realized that it had lost control of the situation in the Arab Republic. At a briefing on April 16, Russian Defense Ministry spokesman Igor Konashenkov said that during the attack on Syria, the Western allies (US, Britain and France) used 103 missiles and guided air bombs. This is stated in the statement of the representative of the department. According to Konashenkov, to destroy missiles Damascus used the S-200, S-125, Osa, Kvadrat, Buk and Strela systems created in the USSR, as well as the Pantsir system developed in Russia. "25 rockets were fired from the" Shell-S1 ", 23 targets were struck. "Beech" - released 29, struck 24 goals. "Wasp" - released 11, hit five goals. C-125 - released 13, hit five goals. "Arrow-10" - released five, hit three goals. "Square" - released 21, hit 11 goals. C-200 - eight missiles were launched, targets were not struck, "he said. The Syrian president told a delegation of Russian lawmakers 14 April 2018 the Soviet air defense were effective in countering the U.S. "aggression" in Syria. Syrian President Bashar Assad praised the quality of Soviet-made air defense systems that he argues resulted in the failiure of the U.S., U.K., and French bombing attack inSyria Saturday, Russian lawmakers said after a meeting with the Syrian president in Damascus. “Yesterday we were faced with an American aggression. And we were able to repel it with Soviet missiles from the 1970s. Since the 1990s, the American films presented the Russian weapons as lagging. And now we see who really lags behind,” Assad was cited as saying by MP Dmitry Sablin. According to the president's [Assad's] point of view, this [the attack] was aggression and we share this position. He has highly appreciated Russian weapons, which showed supremacy over the arms of the aggressors," Russian State Duma lawmaker Sergei Zheleznyak said. Zheleznyak also confirmed that Assad praised Soviet arms made in the 1970s, which were used to repel the missile attack, carried out by the U.S. and its allies. "Since 1990s we have seen in American movies that the Russian weaponry is "backward." And now we see, who is really backward," Assad was quoted as saying by a Russian MP refering to his military’s ability top down most of the missiles. Sablin reported Assad as saying Syrian air defenses had demonstrated their efficiency, the Arab Republic citizens were "no longer afraid of NATO." Assad stated that Syria would continue its independent development "despite the agenda, imposed by the West." Assad also stated that the U.S.-U.K.-French attack has not only "consolidated the peoples of Russia and Syria, but all the nations, which are guided by the norms of international law," Sablin said. He said during a meeting with Russian lawmakers that the cooperation between Russia and Syria should resist the "aggressive policy of the West."